Check out my fly listings in Sharon Wright's new book! This gave me the opportunity to place four of my favorite local Monadnock patterns, including the one at the left that was designed by Frenchy Parenteau in response to blueback herring stocking in Spofford Lake. 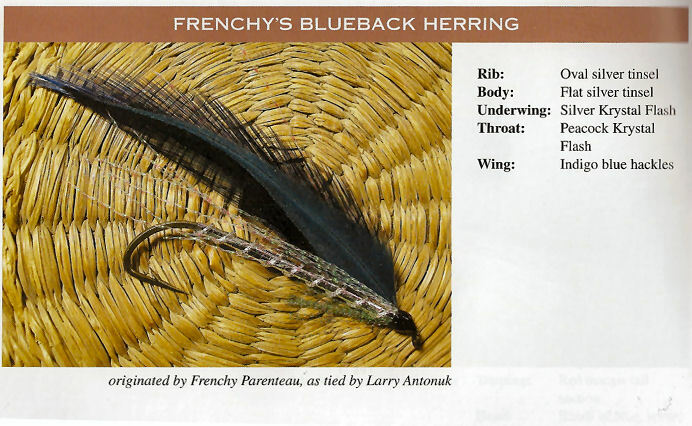 And take a look at my last article in the Spring 2015 edition of Fly Tyer. This was kind of cool. After I got up to speed on the hot flies up at the Miramichi, I realized that there was a bit of history involved, as well as some new exciting patterns. I was able to mold these into a "before/after" article for Fly Tyer magazine, which was published in the February 2015 Spring Issue. 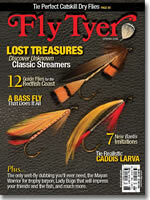 The article contains just about all the go-to flies needed for a spring trip. Click on the image on the left to read the article, or go to the Shameless Self Promotion page to see other articles. It has been said that I just sit at home and tie flies. Not actually true. Sometimes, I go out and tie flies. Here's where I'll be in the near future. What's this website all About??? Is this a business? A non-profit? A non-profitable business? Actually, it's sort of a hobby site that evolved from the time I did my first Atlantic Salmon Fly tying apprenticeship with Bob Wyatt of Concord, NH. I needed a place to show off some of my work, so came up with a website. This was of course before Social Networking was invented. The site now has a bit less personal history, but serves as a place to spread some fly tying knowledge, and perhaps sell a few frames or domes. 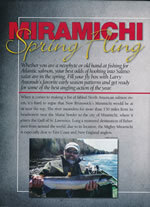 As a bit of a hobby writer I've had quite a few articles published in a variety of electronics, radio, and fishing magazines. The Shameless Self Promotion page is a place where I have posted links to pdfs of the articles. That's pdfs for the newer articles, and painful jpegs for the older ones (I'm working on it.) Anyway, this is a place to which I can refer students and folks of interest when they have a question about an article I've written. © 2015 Larry Antonuk. All rights reserved.